There are two classes of antibody drug conjugate (ADC) linkers: cleavable and noncleavable. Cleavable linkers are labile and are designed to release the unmodified cytotoxin upon internalization by the target cell due to a change in chemical environment (e.g. pH) or a specific protease inside the cell. A noncleavable linker does not contain any mechanism for payload release and relies on antibody degradation through cellular processing for release of the active species. In these ADCs the active species is the cytotoxic payload with the linker and one or more amino acids from the antibody. In addition to studying the usual small molecule metabolism of the payload molecule separate from the antibody, a necessary step in the development of ADCs is the identification of the active payloads of both cleavable and noncleavable linkers from the ADC and any metabolism products involving active forms of likely payload products. In addition to plasma or serum incubations, in vitro systems of purified cellular fractions (lysosomes or S9) or purified enzymes are often used to characterize active payloads released from the ADC.The number of possible species that can be generated when considering the metabolic/catabolic fate of an ADC is vast. One must consider payload-linker species with one or more amino acids attached plus potential biotransformations of the linker and/or payload plus any cleavage or degradation products. 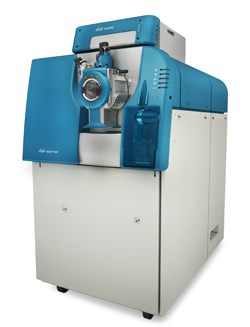 To address this challenging task SCIEX has introduced a specific ADC workflow in the new MetabolitePilotTM 2.0 software. 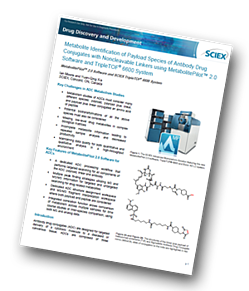 In this technical note the ADC specific workflow features of the new MetabolitePilot 2.0 were used to identify payload products and metabolites from two noncleavable linker ADCs after incubation with human liver lysosomes and S9 fraction.